We grow a large array of heirloom vegetables listed below. We refuse any use of GMO seeds, or inoculants as part of gardening practice. We have many tried and true heirlooms we must have and each year try out new ones here is the good stuff for this year. Dragon Toungue: This Dutch Wax bean has large 6-8” cream-colored pods with vivid purple stripes that disappear when blanched. Pods are stringless, wide, and exceptionally crisp and juicy. Edaname (available for about 3 weeks in August. Maxibel Haricot Vert Beans are unsurpassed as a gourmet market specialty. Maxibel is a heavy producer of dark green stringless, fancy, slender beans, medium green podswith delicate tenderness. Detoit Dark Red (HM): Heirloom beet uniform 3” round roots , sweet and smooth. Broccoli is abundant in calcium & vitamin A. We grow Belstar whose Heads span 6 “. Produces side shoots. Cabbage Tete Noire : The traditional French variety is very rare outside of Europe. Solid, deep-red heads are of good quality and grown as an autumn variety in France. Cour Di Bue: Tender, 3 to 4-lb, pointed, oxheart-type heads; very good from home use or specialty markets. Old European Heirloom. Fairly early and superb quality. Early Jersey Wakefield :1st grown by Francis Brill of Jersey City, New Jersey in 1840. Conical, solid, tightly folded heads are up to 15” long by 7 inches wide & weigh 3-4 pounds. Mammoth Red Rock : Introduce in 1889. Fine Flavor, excellent for cooking, salads & pickling. Premium Late Flat Dutch: Introduce to the US by German Immigrants in 1840. Solid blue-greenflat heads with a white interior and weigh about 10-15 pounds. A salad staple & key ingredient in most soup and stew recipes. Prinz Celeriac -Large uniform, clean white flesh and good eating quality. Delicate, earthy flavor. Consistent moisture during growing season for maximum. Edmonson cucumber: Family heirloom dating from 1913. White –green blocky 4 inch fruits mature to a deep red-orange. Crisp and flavorful even when large; rarely bitter. Good for slicing, salads, & pickling. Boothby’s Blonde: Heirloom from the Boothby’s Family of Livermore, Maine. Excellent crisp, sweet flavor, no need to peel. Creamy yellow , warty fruits with black spines. Satsuki Madori: Japanese low seed and never bitter. Sweet disposition. Suyo Long (HM): Asian variety used for fresh eating, pickling or traditionally cooked. Burpless and tender quality. Mustard is a tasty addition to soups, omlettes, quiches, and lasagna. Mizuna Red/Ruby Streaked: Their mild peppery flavor wakes up a salad; excellent for braising in Japanese Soups. Baby greens are a deep unstreaked red. Combine with the lime-streaked mizuna on the table for a dramatic contrasting presentation. Shungiku (chrysanthemum): Aromatic bright green leaves sometimes added to salads, mild flavor and aroma. Japanese green rich in Vitamin B & minerals & commonly used along with the young stems in dishes such as tempura or sprinkled on top of soup & salads or in stir fry. Atomic Red (SSE):Imperator type roots grow 8-10 “ with good uniformity. Red is retained while cooking. Stands out in fall successions. Cosmic Purple: Sweet & crisp: Purple skin/orange flesh. Crunchy roots& sweet flavor with a hint of spice. Scarlet Nantes: From the 1850s in France. Bright orange flesh, with fine grain and almost no core. 6-7 in root, old time carrot flavor-sweet and brittle. Excellent for freezing and juicing. Stores well. St. Valery (SSE): Dates to the 1885;original seed developed by Vilmorin in France. Fine red-orange roots grow up to 12” long. Deliciously sweet, excellent for storage. White Satin (HM) : White tender roots. Mild flavor and a juicy crunch with every bite. Roots are 8” long at maturity, straight and firm with a small core. Edmundson cucumber: Family heirloom dating from 1913. White –green blocky 4 inch fruits mature to a deep red-orange. Crisp and flavorful even when large; rarely bitter. Good for slicing, salads, & pickling. Boothby Blonde (HM) : Unique Heirloom is short , plump with creamy yellow skin and black spines. Melon Amish: Amish heirloom. Oval fruits are 9”; long and weigh 4-7 pounds. Sweet orange flesh is very juicy with fall muskmelon flavor and rather thick rind. Moon and Stars (Cherokee) (SSE): Fruits are 2 feet long and weigh 10-16 pounds. Bright pink flesh. Apple Green: Developed by the late Professor Meader in 1964. Pale green skin & mild flesh non-acid flavor & no need to peel. Black Beauty : Standard open pollinated Italian with no spines. Large bell-shaped fruits range from 1-3 lbs and have a slight signature ribbing. Medium to thick skin is deep purple. Ping Tung Long: HEIRLOOM- A prolific , early producing Asian eggplant with glossy purple skin and bright green calyx. Slender fruits average 12-18” long and 1-2” inches wide. Very tender skin does not need to be peeled. Awesome on the grill. Rosa Bianca; Italian Heirloom creamy & tender. Heirloom –A lovely Sicillian variety with a light pink-lavender fruits streaked with colors of creamy white and violet. Mild creamy taste with no bitterness and a very low number of seeds. Listada de Grandia: Purplle & lavender Stripes on succulant milky white skin . Skin so thin it need not be peeled. Specialty purple striped Italian eggplant with an oval egg shape. Fruits are tender & delicioius. Skin is thinner than most Italian types. Tres Fine Maraichere Frisee Endive: Voluminous, self-branching rosette of deeply cut, slender outer leaves surrounds a tender creamy heart. Bellesque: Beautiful rosettes of long green leaves with a frilly outer edge & sweet whole midribs. Rhodos: Tres fin type endive has deeply cut leaves, pale green outer, blanched at the heart. Called frisee by many when used in a mix. Mild taste for the blanched inner sprigs adds unique contrast to any mix. Its “bulb” and foliage are all use in a myriad of salads, crudités, potato mashes, soups, pasta dishes, & savory gratins paired with ham & potatoes. Solaris:Earliest fennel with bulbing. Stout, heavy juicy bulbs are anise flavor and grow to impressive size. Excellent for baby fennel. Florence: Can grow to 2 ft tall with thick bulb tasting of mild licorice. Absolutely delicious sautéed in butter or roasted with root vegetables. Finale (F1) (HM) 80 day: High Mowing trials 2009 vigorous plants and large bulbs. Crisp, juicy texture and pleasant flavor. GARLIC: We have been saving garlic seed since 2003 from a woman who developed her own variety called Montana Giant. After several years of growing garlic in your own soil the garlic takes on some of the soil qualities in a sense. So that is why she herself renamed it. In reality there are only 9 different types/varieties of garlic. So this one we have saved every year since then is large cloved and spicy strong garlic flavor. Batavian Escarole (HM): Full-hearted escarole with large, broad, lettuce-like leaves that form tightly-packed heads. Best type of chicory for blanched tender hearts with a mild, nutty flavor. Blood veined sorrel-a beautiful heirloom-deep-red veined dark green leaves. Cultivated by the French and Italians for centuries. Laxative be careful. Heat tolerant. Indigo Radicchio: Burgandy leaves with white ribs, Mild , just shy of bitter flavor. Its is a terrific scissor-cut in soups and pasta dishes or use fresh in salads. Red Russian: Heirloom-bright purple stems with slate green, deeply lobed foliage.Leave are tender and smooth compared with other kales & very sweet. White Russian : Simlar shaped to the Red Russian, light green/white stem and green leaf. Voted best bestingand known abroad for being sweet and Tender. Lacinato: Heirloom- Darkest Blue green color of any akle, bumpy leaf surface. Often used as Kale Chips. Bloomsdale Spinach: Bloomsdale Spinach is an heirloom variety, with large, Kelly green colored leaves. Each leaf is puckered where it meets the stem and has a sweet flavor and succulent texture. Bloomsdale spinach has a more substantial, winter greens taste and texture than standard spinach. Breen (HM): Mini red romaine with unique coloring and great disease resistance. Good for all seasons. Burnished red color and pronounced pale green mid-rib and veining. Bronze arrowhead (SSE): HEIRLOOM- German Seed Hailed as “the finest most colorful and delicious leaf lettuce for the home garden. Forrenschluss (SSE): HEIRLOOM-Romaine-Gorgeous Austrian heirloom with green leaves speckled with maroon. Holds up very well in heat. Freckles (HM): Red romaine Unique coloring. HEAT TOLERANT variety with unbeatable buttery texture. Laves are splattered with crimson on bright green background. Lolla Rossa: curled looseleaf lettuce with pale frosty green shows beautiful rose coloring at the leaf margins. Merveille Quartre saisons (SSE)-: HEIRLOOM- French heirloom described in Vilmorin’s The Vegetable Garden (1885). Pretty red bibb-type rosette with a crisp texture and excellent flavor. Does well in all sorts of climates ans can withstand heat. New Red Fire Lettuce (HM) : Ruffled , fringed leaves. Red Velvet (SSE): Absolutely striking appearance. Top leaves are solid maroon, and backs are green tinged with maroon. Slowbolt. Speckled (SSE): HEIRLOOM-Family heirloom sent to SSE in 1983 by Mark Reusser originally from a Mennonite Family in 1799. Juicy thick leaves are green tinged with red. Mild Flavor. Black Seeded Simpson: Bright green open open head with slightly crinkled leaves. Bunte Forellenschluss (SSE): The butterhead companion to the Forenschluss romaine. “Bunte” means “colorful” in german. Sweet apple-green leaves splashed with maroon. 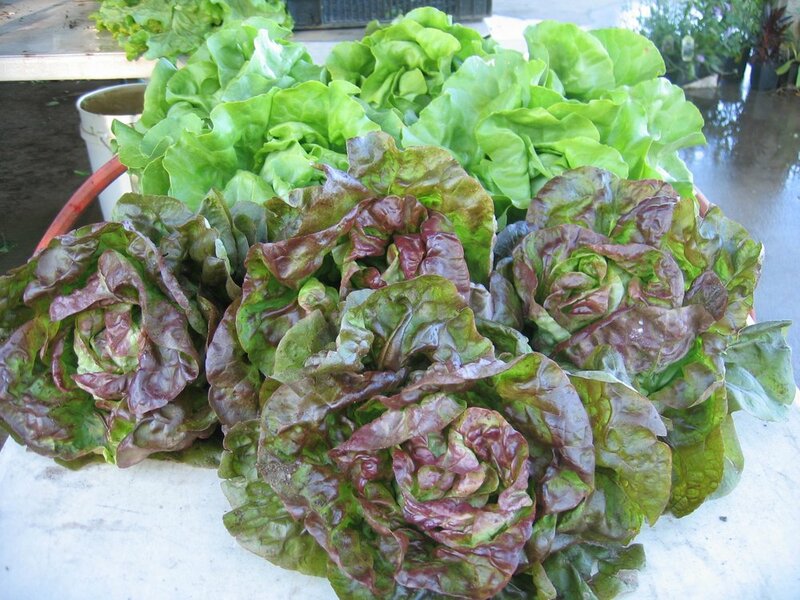 Cimarron Red Romaine Lettuce (HM): Spring-large red romaine for early to late spring production or baby leaf. Golden red outer leaves and bright green center. Grandpa’s Admire’s (SSE): HEIRLOOM-In 1977, 90 year-old Chloe Lowry gave this family heirloom to SSE. Bronze tinged leaves for large loose heads. Mild flavor , slow to bolt, even in extreme heat. Gulley’s favorite (SSE): Butterhead type; round, dark leaves with moderate tinged and slightly undulating edges; very good eating qualities, crisp texture, good flavor. Jericho Romaine Lettuce (HM): Tall heavy heads with light green leaves. Excellent summer flavor and silk texture. Lovelock Lettuce (HM) A heat tolerant, heading Batavian lettuce form production all season long. Heads close in late at maturity creating a dense crisp head. Lovelock has whorls of bright green leaves with deep coloring on the leaf margins. Red Leprechaun (SSE): Shiny dark purple savoyed leaves with distinct pink center rib. Good flavor with a slight bite. Crisp blanched hearts. Mature head can weigh more then one pound. Romaine. 60 days. Reine Des Glaces (SSE): Crisphead- Dark green deeply-cut pointed lacy leaves. Medium to dark green crisp heart. Stay crisp even on hot days. Sanguine Ameliore (SSE): Rare French Variety introduced in 1906 by C.C. Morse & Co, as Strawberry Cabbage Lettuce. Stunning sanguine or blood red speckles. Tender texture and excellent quality. Sylvesta Lettuce (HM): Large, dense, emerald green heads are sweet and tender. Suitable for spring and summer plantings. Good resistance to bolting, downy mildew, and aphids. Tennis Ball (SSE) Small rosettes of light green leaves measure only 7” in diameter and form loose, tender heads. Grown by Thomas Jefferson at Monticello. Tennis ball lettuces were often pickled in salt brine during the 17th and 18th centuries. Yugoslavian Red (SSE): Butterhead apple green leaves tinged with pomegranate red, the buttery succulent flavor pairs well with apples or strawberries for a sweet summer salad. Red tinged form loose heads that can measure up to 12 “ across. The interior is green and almost white. Excellent mild flavor. Calibra F1 (HM): An excellent keeper with sweet and mild flavor that sweetens in storage. Long Red Florence: Uncommon Italian heirloom. Beautiful long bottle shaped bulbs, attractive color. Flavor mid and sweet. Best for fresh eating. Red Cipolini onons: Up to 3”-4” in diameter with a flattened coin shape. Crisp white interior with bright red-purple skin. Sweet onion flavor for roasting and grilling. Rossa Di Milano-Heirloom- Midsized Italian variety. 4-5 inch bulbs are top shaped, uniformally colored and have tight skins. Siskiyou Sweet Walla Walla: Light brown skin with white flesh that is very mild and sweet. Valencia: Large 4-6 inch globes, up to one pound, with warm golden-brown skin. Utah strain of Yellow Sweet Spanish Onion is mild flavored. Yellow of Parma (SSE): Imported from Italy. Oneo f the best storage onions. Ambition (TS hybrid): Dutch shallot grown from seed, with incredible storage life. Bulbs are 2-3 inches long with warm reddish brown skin and white flesh. High sugars and are great for caramelized onions. Camelot:Gorgeous elongated globed shaped red shallot bulbs. Extremely versitlile in the kitchen, adding a rich subtle, onion taste that cannot be duplicated. Saffron (TS hybrid) 100 days: Pale yellow interior with bright coppery skin and exceptional shelf life. Zebrune (SSE): Heritage shallot form France where it is called Cuisse de Poulet du Poitou, translate to leg of a chicken. A type of Eschalion, or banana shallot, so named for its distinctive torpedo shape. Pink,brown bulbs are sweet, mild and a must for gourmet cooking. Crimson Forest Bunching: Brilliant red stalks , flavorful and tasty. Ishikura: Popular and traditional Japanese variety for sukiyaki, soup and salads. Reaches enormous proportions (2. 5 feet and one inch across) while remaining tender and scallion like. Never forms a bulb. Earth up as for leeks to produce long white shanks. King Richard leek( 75 days): No hilling necessary. Will overwinter but will tolerate light frost. Tadora Leek (110 days): Winter leek with stocky medium length, dark Green shaft that size up well and hold into the fall. Burgandy Okra-Burgandy pods are best at 6”-8” long when they are tender. Clemson spineless okra-Best known for lack of spines and beautiful emerald pods. Okra poole’s:Grown in Texas since the 1900s good flavor and texture best eaten under 4” inches. Snap Pea Cascadia: Heavy harvest of juicy, thick walled 3” long pods. Stringless 60 days. Sugar Snap Pea (HM): The king of snap peas, this is by far the sweetest, making it worth the wait. 6-7 ft tall, trellis (67) days. Mammoth Melting Snow Pods: Trellis 4-5 inch long snow pea. Corno di Toro: (HM) 78 red: HEIRLOOM This highly attractive Italian variety was extremely popular in High Mowing 2006 taste tests. Tapering fruits are 8-10” long and thin, often with a slight bull horn curve, deep crimson red color when fully ripe. Georgia Flame (SSE) : A piquant pepper from the Republic of Georgia, up to eight inches long, with thick crunchy flesh. Great for Salsa. Golden Californa Wonder: (HM) 78 gold: Deep orange and thick-walled peppers very similar to California Wonder with earlier maturity date. King of the North: Blocky uniform and great sweet flavor. Napolean Sweet (SSE): Eight inch elongated bells are as mild as apples.Ripen to red. 70-90 day (Sweet). Shishito (HM) 75 red: Small , mild Japanese pepper for roasting, pan frying & grilling. Slender fruit are 2-4 “ long and 1” wide. Flavor is mild , when turned to orange-red with slightly sweeter flavor. Thin walls make it especially suited to roasting , frying, frying or grilling; under heat it will blister and char easily, taking on rich flavor. Cooked until soft, then sprinkled with sea salt, Shishito has gained recent rapid popularity as a gourmet appetizer. Sweet Chocolate: Thick sweet flesh. Very mild flavor. Topepo Rosso 70 day red: HEIRLOOM-early pepper with a unique shape and sweet flavor. Squat, smooth skinned, rounded fruit with extra thick, meaty walls. Lipstick red fruit measures 2-3” wide by 2” tall and resembles a tomato (hence the name Topepo, which combines the word tomato and pepper). Topepo Rosso is a piemento Pepper, a type that is sweeter and more succulent, and earlier maturing then bell peppers. Ancho Pepper (SSE): The standard Mxican variety for sauces and stuffing, excellent for chili rellenos. Willoway Farm and our neighbors annually make chiles rellenos utilizing our eggs for part of the batter. They seriously are the best chile rellenos we have ever had. Anaheim ( Nu Mex Joe E. Parker) (HM) A southwestern-style traditional Anaheim Chili pepper. Butte (russet); Handsome Russet baker with outstanding flavor. Highest in Vitamin C and protein. Great baked , mashed or , fried. King Harry: New round-white Irish Potato from Cornell. Moderately moist and waxy texture. Good Baked and boiled. Carola: Sunny Yellow potato form Germany boast a smooth creamy texture with exceptional flavor. Suitable for baking and frying. Caribe: Lustrous purple skin covers a smooth snow white flesh. Great potato for boiling , baking or frying. Rose Finn Apple Fingerlings: Rare and beautiful rosy colored heirloom fingerling potato with moderately dry yellow flesh. Splendid baked or boiled. White icicle radish: White Icicle: Icicle radishes date from the early 1900s. Crisp white flesh is pungent but pleasant. Pink beauty: Bright Pink egg-shaped garden radish with a crisp white flesh. Moderately spicy flavor. German Giant (BSHS): Very large, round radish that was collected in Germany. These keep their fine quality even when large. This heirloom is very popular with the Amish. Mild and tasty. Long Black Spanish (BSHS): HEIRLOOM-Long 9” black roots have pure white flesh that is crisp and pungent. This long version of Black Spanish is much harder to find than the round. For fall plantings. This is a very old European heirloom. Misato Rose (limited from BSHS): This variety produces 3-4 in roots and is recommended for fall sowing. Skin runs from light pink to green, but its flesh is the real treat, being bright pink, sweet, spicy and flavorful. Watermelon: Flesh is surprisingly sweet , crisp and refreshing. Joan: refined strain of America’s purple top. Flesh is dense and crunchy with a delicate sweet flavor. Delicious roasted, mashed ans as a base for winter soups. Costata Romanesca: Nutty & creamy. Believed by many to be the best tasting heirloom Italian zucchini. Although production are less then some zucchinis , the taste and texture are excellent. Fruits are medium gray-green with noteworthy ribs. The blossoms are large and ideal for cooking. Patty Pans –Pattison Panache’ –Jaunue et Verte. Good eating qualities when young. Anna Swartz Hubbarb (SSE): HEIRLOOM- Family heirloom given to Anna Swartz by a friend in the 1950s. Good storage ability and hard shell. High quality flesh is the color of a sweet potato and has a similar flavor. Baby Blue Hubbarb (HM): Smooth, gray-blue skin and sweeter flesh than the standard Blue hubbarb. Fruits of the 5-7 pounds are consistent quality and teardrop shape. Baby Pam Pumpkin (HM): The standard for uniform pie pumpkins with long handles and bright orange skin. Dry, stringless flesh cooks down to a smooth filling, buts its sugary flavor is what beats all the others for pie making. Burgess Buttercup (HM): Dark green skin with a gray button on the blossom end. Golden orange, stringless flesh and a sweet , richhave made this squash a long time New England favorite. Typically produces 10-12 fruits of 3-5 pounds each per plant. Crown Pumpkin (HM): A delicious eating pumpkin with hard blue-grey skin and rich orange flesh. Originally part of the Koanga Gardens collections of heritage seeds in New Zealand, seed for this variety was lost for some time. It is a delicious eating squash . Excellent keeper. Delicata (HM): Incrediably sweet flavor and superbly delicate flesh have made Delicata the darling of squash lovers. Fruits are 1-1.5 libs each and can be eaten with skin on after baking or boiling. High Mowing strain is of the highest quality available, carefully selected since 2001 for uniformity af size, shape and color as well as yield, non-bitter and non-hardshelled fruit. Musque De Provence (pumpkin): HEIRLOOM- Gorgeous French variety also known as Fariytale. Richly colored green background and orange become increasely buff when ripe. Fruits are large, often weighing 15-25 pounds, flat in shape and deeply ribbed. This edible pumpkin, often enjoyed cooked, is also traditionally eaten fresh. The flavor is exceptionally complex and sweet with a nice light crunch. May sound strange, but it will surprise you! Red Kuri (HM): Also known as Baby Red Hubbarb and Orange Hokkaido, these teardrop-shaped, strikenly red-orange squash from Japan smooth, sweet, dry deep orange flesh. Fruits 3-4 lbs size. Spaghetti Squash: Fork out the squash pasta! This has to be baked or broiled before the fibers separated into noodles, resembling spaghetti. Oblong medium-sized light yellow fruits have sweet flesh. Sweet Fall (SSE): From Nebraska. In donation letter the donaters they prefer to eat the squash with only butter and salt, as it is so sweet that no sugar is needed. Hubbarb type, teardrop shaped fruit; attractive orange and blue-green skin; fruits average 4 pounds; excellent eating qualities, very sweet, unique flavor. Winter Luxury Pumpkin (HM): HEIRLOOM- High Mowing’s sweetest pumpkin pie with ornamental flair. The deep orange skin is decorated with silvery netting and slight is giving it a unique and magical appearance. Interior flesh has a velvety texture and sweet flavor that is excellent for pie, cheescake and soup. Fruits average 6 pounds and about 6 inches in diameter; similar in size to the New England Pie pumpkin. Delicious flavor and distinctive appearance but not a great keeper. This heirloom first appeared in 1893 (When Willoway Farmhouse was built). Aunt Molly’s Ground Cherry: Native of eastern and central North America. Outstanding Polish variety prized for its unique flavor. Easy to grow, prolific & super sweet. Blue Beauty: cross between beauty king and a blue tomato-8 oz beefsteak slicers. Antioxidant content. Lemon Drop: Refreshing tart-sweet flavor. Amana (BCHS): Big , one pound orange beefsteak have intense full flavor. Amazon Chocolate(*BCHS):Slicing type fruits to 1# +. The flavor has been described as sweet, rich, complex, and having wine like overtones. Said to be originally from Ukraine from the Black Sea region. Amish Paste: Heirloom 5-7 oz. acorn paste tomato, very meaty with few seeds and rich in flavor that intensifies in a sauce or paste. Aunt Ruby’s German Green: Family heirloom of Ruby Arnold of Greenville, Tennesee. Large beefsteak fruit weigh one pound or moreSweet juicy flesh with a hint of spiciness. Ready to harvest when soft to the touch & yellow green in color. Berkley Tie Dye (*BCHS)(75-85 days) ind: Large fruits have orange-red and yellow-green stripes. Super dense meaty flesh with almost no juice has strong assertive flavor that is tangy, but also sweet. Black Mauri (BCHS): A beautiful deep chocolate brown , grape tomato that is sweet, flavor ful and has a crisp crunchy texture. Russian, high yields, even in hot conditions. Black Prince(BCHS): An heirloomfrom Irkutsk Siberia. The 5 oz tomatoes are round and very uniform, the color is a wonderful deep blackish chocolate brown. The flavor is as deep, sweet and rich as the coor. A unique slad tomato. Brandywine (Sudduth’s Strain)-Large pink beefsteak fruits to 2 pounds. Incredibly rich, delightfully intense tomato flavor. Djena Lee’s Golden Girl: Minnesota Heirloom, won 1st prize in Chicago’s World Fair in 1930’sProlific clusters of light yellow fruits. Black Icicle: Stunning, perfectly shaped , deep purplish-brown almost black . a great variety for both home gardeners and chefs. This tomato has the incredible rich tomato taste that is in many of the large, dark beefsteak types, sweet, rich, with earthy overtones. From Ukraine. Black From Tula: Deep reddish-brown beefsteak has a rich old fashioned flavor, sweet and spicey tomato flavor that is delicious. A rare Russian heirloom. Black Prince Heirloom (*BCHS): Heirloom from Irkutsk, Siberia. The 5 oz. tomato is very uniform in size; the color is a wonderful deep blackish-chocolate brown. The flavor is deep sweet and as rich as its color. A unique salad tomato. Black Sea Man: Russian Heirloom from Marina Danilenko. Medium-sized brown pink fruits with olive green shading. Well marbled flesh is attractive when blanched and peeled. Rich Flavor. Black Vernissage: 2oz tomato great for rich tasting sauces. Blondekopfchen: East German Heirloom. Small golden fruit 1” fruit, excellent sweet taste. Cherokee Purple: An old Cherokee Indian Heirloom, pre-1890 variety; beautiful, deep, dusky purple-pink color, superb sweet flavor& very –large-sized-fruit .Real old time tomato flavor. German Pink: Bavarian variety, 1-2 pounds meaty fruits, few seeds, full of sweet flavor. Excellent for canning or freezing. Gypsy: Named for the Gypsies who lived in Russia, this is one of the deep purple and maroon tomatoes. It has gorgeous color and good taste. Perfect, ,edium-sized globe fruit make this one of the nicest dark varieties. Green Copia (BCHS):76-80days: Oblate, beefsteak fruits run in medium sized range. When ripe the luscious fruits are striped in alternate bands of apple green and pale pink.Make gorgeous and delicious bi-color slices. Green Sausage: paste tomato/Beautiful elongated 4” fruits are yellow with green stripes. Firm flesh with rich sweet flavor. Great for making sauces. Hillbilly Potato Leaf Tomato: Gorgeous slicing tomato from Ohio. Sweet juicy 4-6” flattened fruits about 1 pound each. Beautiful yellow fruits are streaked with red on the blossom end. Japanese Black Trifele: One of the best black tomatoes, rich in full flavor, great for canning. Size of a Bartlett pear , weighing 4-5 oz, bred in Russia. Highly prized & demand high prices. 6 oz. fruit. Rich and complex flavors. Hungarian Heart: Originated in a village 20 miles from Budapest around 1900. Huge pink Oxheart fruit weighs upwards one pound. Very few seeds. Good for fresh eating, canning and for making roasted tomato sauce. Indigo Apple: Complex yet sweet tomato flavor- high in anthocyanin (an antioxidant). 2-4 ounce . Isis Candy: Gorgeous bicolor cherry tomatoes are red with spectacular cat’s eye starburst on the blossom end. Rich, sweet fruity flavor. Italian Heirloom Tomato: Beautiful huge heirloom from Italy. Excellent full tomato flavor. Easy to peel, ideal for slicing & canning, very little waste. Mamie Brown’s Pink (*SSE): From Iowa. Large Beefsteak type. Fruit shape ranges from slightly flattened to round to slightly heart shaped: Good flavor, balance sweetness and acidity. Nebraska Wedding: 3-4 “ round fruits with shiny orange skin, & orange flesh, very meaty, well balance flavor . (Require staking but the plants are less then 36 “ tall). Det. Red Zebra: very sweet and flavorful. Salads. Nyagous Tomato: Great black tomato that is blemish free! Baseball-sized fruits are bourne in clusters up to 6 fruits. Excellent full tomato flavor, aromatic, and have sweet , meaty flesh,that has a rich taste. Seed obtained from German tomato collector, Reinhard Kraft. Omar Lebanese (BCHS)Huge pink fruit that can grow as large as 3-4 pounds.The mammoth fruit have a superb flavor : sweet , perfect tomato taste. Opalka: Polish breed brought over around 1900. 3”-6”red paste tomato with excellent flavor. Peppermint (*BCHS): A lovely heirloom from the mountains around Crab Orchard Tennesee, this variety produces large 1 lb tomatoes that are beautifully striped with red and orange. The Flavor is sweet and mild, perfect for eating like a fruit. Pierce’s Pride (BCHS): Medium-sized fruit are very flavorful and rich. They are nicely shaped , deep, dark black red in color. Very tasty tomato. Rose Tomato: Heirloom from the Amish in New Holland, Pennsylvania. Large, meaty, dusty rose colored fruits. Great Taste, rivals brandywine. San Marzano: The traditional sauce tomato in Italy. Long blocky 4 oz. Intense flavor perfect for paste. Sheboygan: Grown since early 1900’s by Lithuanian immigrants in Sheboygan, Wisconsin. Pink paste type 4-6 oz. fruits. Excellent flavor. Great for canning. Speckled Roman: Gorgeous 5” long fruits with jagged orange and yellow stripes. Meaty flesh with few seeds. Great tomato taste, ideal for processing and fresh eating. Polish Linguisa: Best tasting paste tomato wehave fund: 8-10 oz. meaty enough for saucing and good for slicingor eating out of hand. Tommy Toe: Cherry tomato. Superb flavor won it top billing over other varieties in an Australian taste test. Velvet Red: Winner of taste test at Seed Saver’s Exchange 2009 tomato testing. Striking silvery grey miller type foliage. 1 inch cherry tomatoes, excellent sweet flavor. Violet Jasper: 1-3 ounces good tasting, dark purpleish-red flesh. Bulgarian rich dark flesh is full of smokey organic taste. White Tomesol (BCHS): 8 oz, sweet and rich. Wisconsin 55: Excellent all purpose tomato, great for canning. Genovese Basil: The classic large leaf Italian sweet basil priced for its spicy flavor & wonderful aroma. Lettuce Leaf Basil: aka Large Leaf Italian- Classic basil. Named for large crumpled & fluted leaves that are 3-4 “long. Mrs. Burn’s Lemon Basil: Heirloom Strain from New Mexico. Intense Citrus aroma, popular for vinegars and seafood dishes. Dries nicely & one of the finest strains of lemon basil available. Rosie Basil (HM): A favorite in High Mowing trials for its unique color ad due to its mild and aromatic basil flavor which sets it apart from green basils. Lemon Balm: Strong Lemon scented leaves used for maling tea. Said to have a calming affect on upset stomaches. Empress of India-Old heirloom with dark foliage and brilliant fired red blossoms that are delicious in salads. Popular in Victorian times. King Theodore-Fashionable, dark green plants have mahogany-red blooms with chocolate overtones. Heirloom form the 1890s. ground cover. The flowers are creamy –yellow, pale and beautiful. Tall trailing Mix-Heirloom favorite, grows up to 10 feet. Bright cherry flowers come in shades of yellow, orange and red. Double delight apricot-Mottled apricot shades. The flowers have delicate appearance giving unusual texture. Rippling Water- Very showy , dark purple-blue flowers with white edge. Tiger Eyes-Gold petalsinlaid withintricate black veins.